The Museum of Edinburgh, formerly known as Huntly House Museum, is a museum in Edinburgh, Scotland, housing a collection relating to the town's origins, history and legends. Exhibits include an original copy of the National Covenant signed at Greyfriars Kirk in 1638 and a reconstruction of Field Marshal Earl Haig's headquarters on the Western Front during the Great War, the latter exhibiting items bequeathed to the Museum. So after 80 years, the Museum of Edinburgh in the Canongate has abandoned its pared-down, neutral look, got itself all fancied up and is determined to be going places. With its bright ochre walls and pillarbox red woodwork, it’s no longer just the sort of place you can walk past without a second glance. Or even the sort of place where a second glance leaves you none the wiser as to what lies behind its 16th-century façade. Which is why what’s going on inside is all the more important. The museum, which has long portrayed itself as the city’s historical treasure chest, a maze of rooms crammed with iconic objects from the Capital’s past, including curiosities like Greyfriar’s Bobby’s collar and bowl and John Knox’s spectacles case, reopens tomorrow after an £800,000 revamp. Machine details. The single die electric machine which is situated in the gift shop. 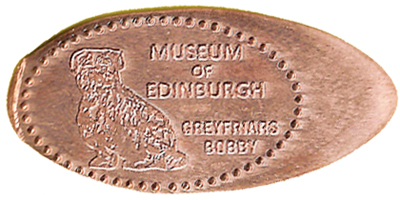 The penny has a picture of Greyfriars Bobby, dotted border.